Ratan Ayurvedic Sansthan has brought in the cosmetics industry by launching herbal Korra hair coloring shampoo through which hair coloring can be done in 10 minutes only by shampooing the hair . You will get rid of problems of giving hours to color your hair. Ratan Ayurvedic Sansthan has made the product in India by which color can be done by just shampoo after years of research. 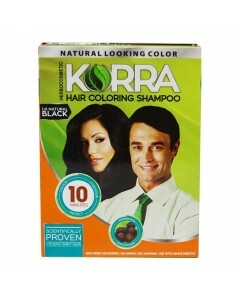 In general market the process for hair color is same like mixing of colorant and developer and with the help of brush and assistance, you are able to get your hair color after almost an hour s and inconvenience and at the same time you have to face the side effects like spots, itching and waste.Korra hair coloring shampoo can be used by self with easy process like shampoo, within 10 minutes your hair get colored and does not leave any spot. After using this there is no any kind of itching or burn and saves more of your time. No need for mixing of 2 pouches. There is no assistance required by anybody.